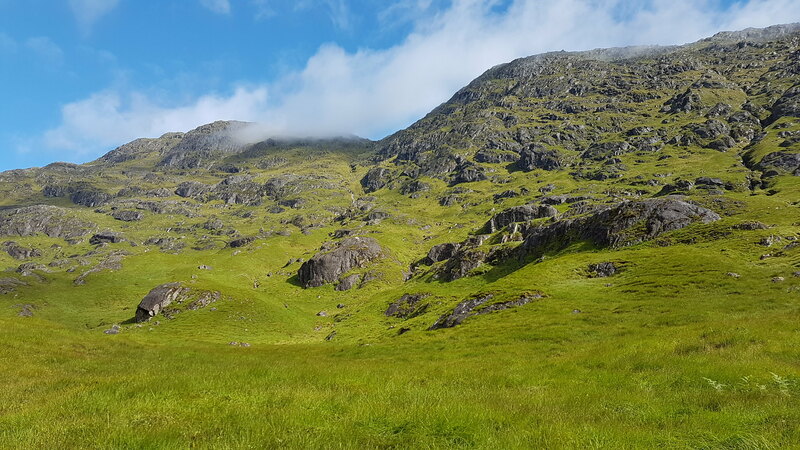 Ever since I watched a Cameron McNeish Coast to Coast programme back a good few Christmases ago (2012), I have been greatly looking forward to tackling the hills up Glen Dessary and in particular, Sgurr na Ciche. 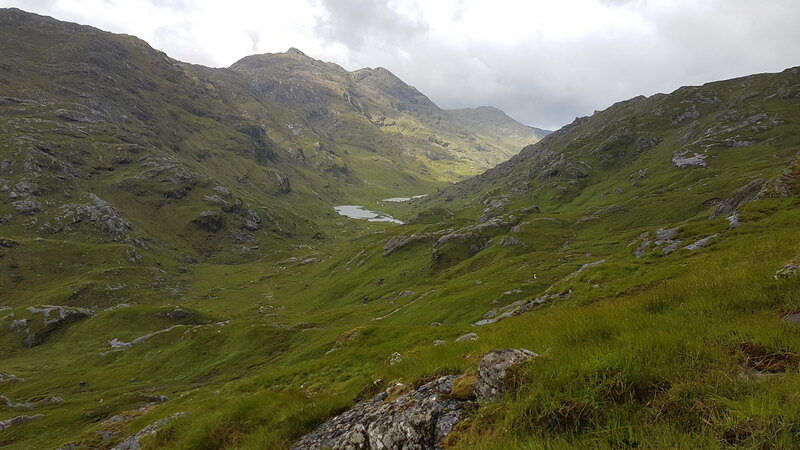 I recall that programme introduced me to the wider lure and wonders of Knoydart and spurred me on to doing a testing trip in May 2013 to Barisdale and Ladhar Bheinn in very mixed conditions. the dire forecast and the comfort of my bed put paid to that and Saturday became a day for domestic duties. I was itching to get out though and noted on Saturday evening that there were some areas out west showing improvement; Dessary was calling! After slithering out of bed at 4am and a quick breakfast, I was away by 4.30 in two minds about which route to take. 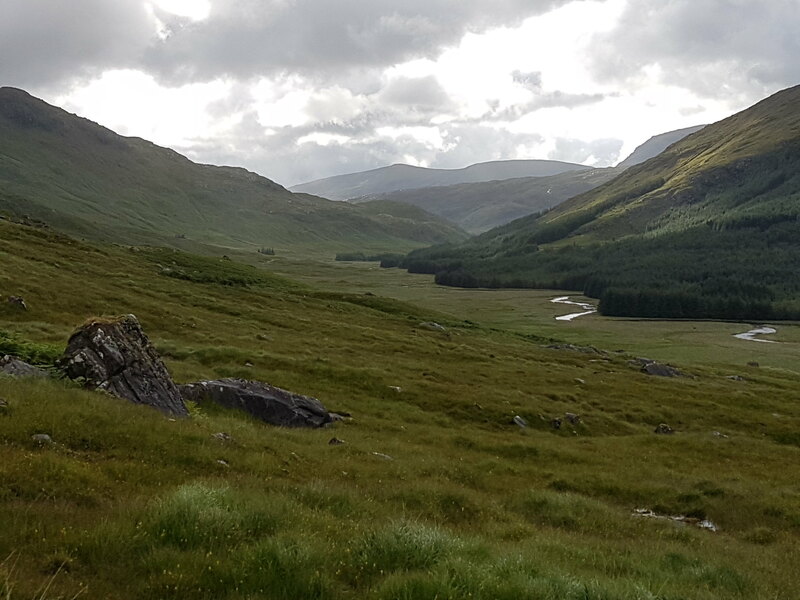 I opted for the longer route via the A9 and the A86 and made good progress up to Spean Bridge, where I stopped for a break to marvel at The Ben and the Grey Corries, which were looking clear and resplendent. 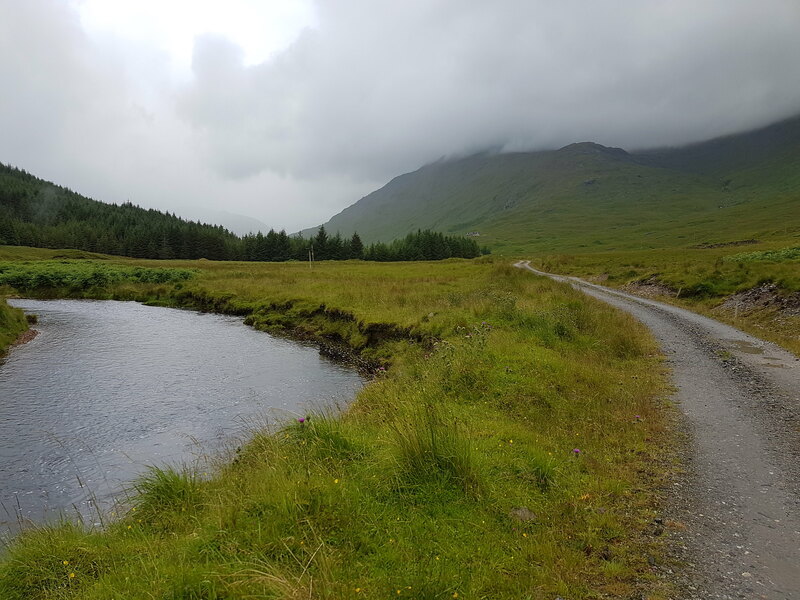 I had not been to Arkaig before and was thinking if I do a report I won’t mention that 'road', which is pretty hard to ignore. I had envisaged some airborne driving a la Dukes of Hazzard but decided to go for the self-preservation option. It took me the best part of an hour to reach the car park at the end, where on arrival it was bucketing down and the skies were looking decidedly 60’s tower block grey. The thought of staying in the car was very tempting but after that longish drive in and with the prospect of a big day ahead of me, I decided to take the plunge (literally) and to crack on. After a quick change into waterproofs and a few expletives, I was on my way. Thankfully once I got going the rain eased. 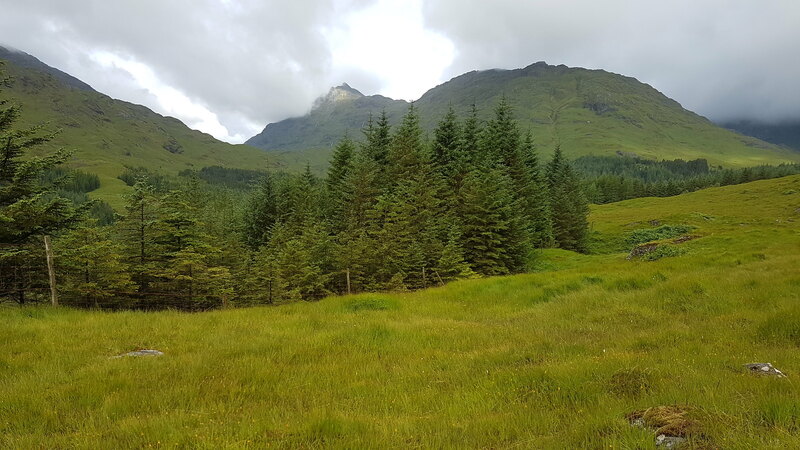 For todays walk, I had decided to go clockwise and give the forest a miss (not great views) as I had plans for A’Chuil bothy for another day and it looked further on the map. 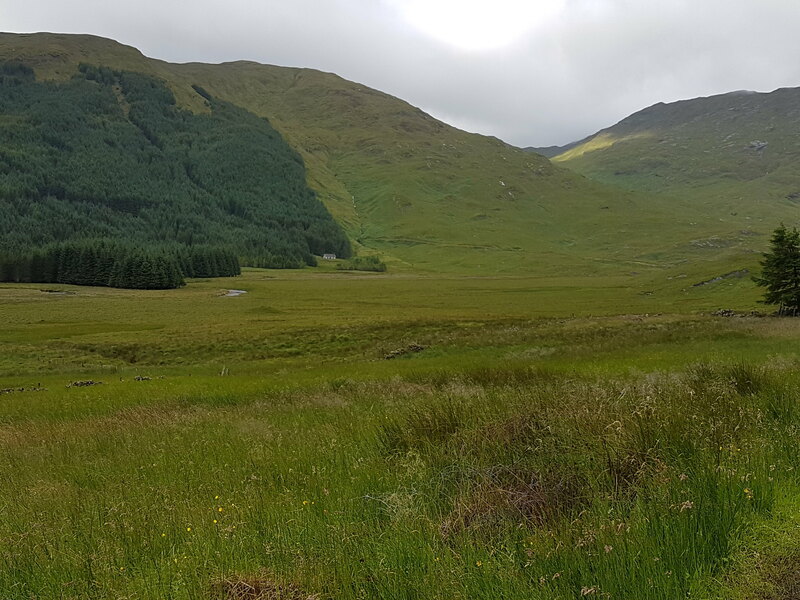 The trudge along the track got a little tedious after a while and I was sort of glad to get off it once past the last Glendessary House. That gladness quickly wore off as that was where the uber-longish bog trot began. Whilst the time went by quickly skirting the north side of the forest, the boggy ground made for slow progress. My feet were sodden pretty quickly. I completely missed the bridge over the Allt coire nan Uth; its easily done. The burn was in full spate and getting across wasn’t easy. I think this has to be the boggiest track I have done to date. Once past the forest, the weather improved and I was able to enjoy blue sky for a few minutes. The Corbett, Bidein a Chabair, which had dominated most of the walk-in was looking fab. I had stuffed the route instructions and my map down my jacket in case I needed to get it out quickly and had my GPS to hand. 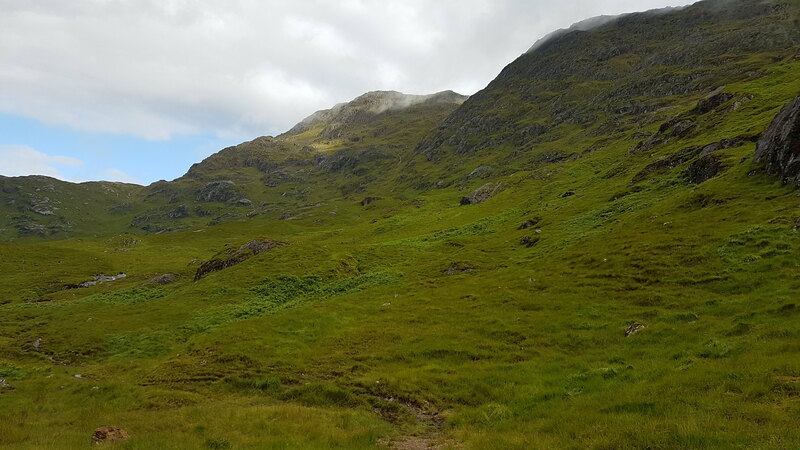 Sadly the conventional OS Map wasn’t loading/working and I was staring at a screen with a less detailed map that was wholly inadequate but showed me that I was ‘close’ to Sgurr na Ciche and I was sort of heading in the right direction. It was at this point I made a very lazy and super-sized navigational boo-boo and struck off the path too early. 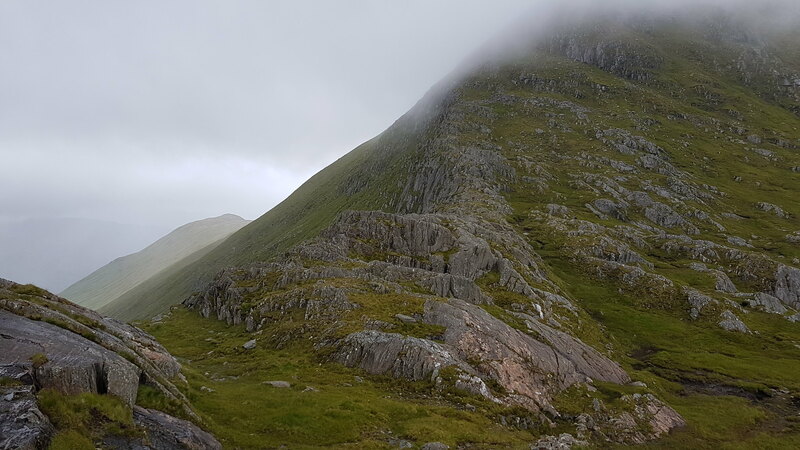 I had convinced myself that I didn’t need to climb up to the Druim and was too eager and went a for direct route up thinking I was going to find that gully below Feadan na Ciche. It was a slow, wet and tiring climb up and in places it was very steep, pathless and slippy. The local deer population weren't impressed with my manoeuvres and disappeared before I got anywhere close to them for a photo. I was having to hold onto clumps of soggy grass for dear-life and managed to lose my footing a number of times as I had to re-route around slippy rock which I found too difficult to scramble up. 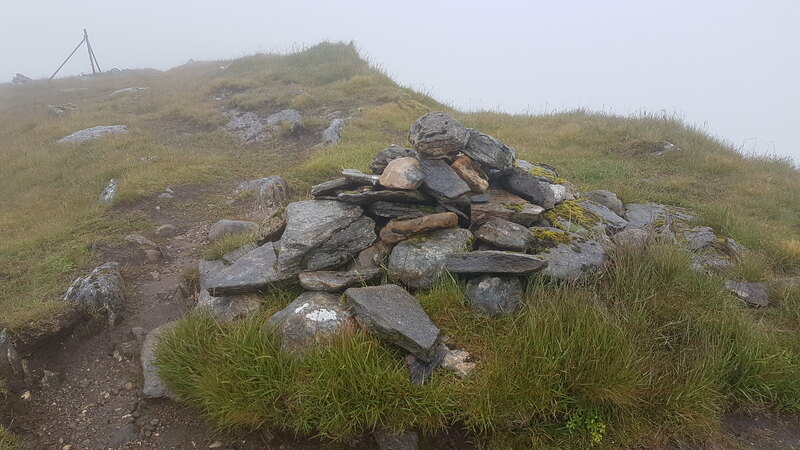 I don’t know how long the climb up took me, but it consumed an inordinate amount of time and the aforementioned Feadan na Ciche never materialised. By the time I did reach the ridge and the wall it was bloody windy and viz was down to about 10m. I decided to hunker down and get out of the wind behind a boulder, add clothing and take a quick feed. It was at that point, that a guy called Mark from Sheffield, who was passing called. He had been camping on the ridge and was carrying a big pack. He had assumed because of where I had topped out at, he was at Feadan na Ciche. How wrong we both were! After some initial ascent, we came to a cairn which came far too quickly and bamboozled both of us. We decided to plod on further expecting more ascent, but as we continued drifting away from the wall and sensing that we were losing height, it occurred to us that we may have missed something further back up. 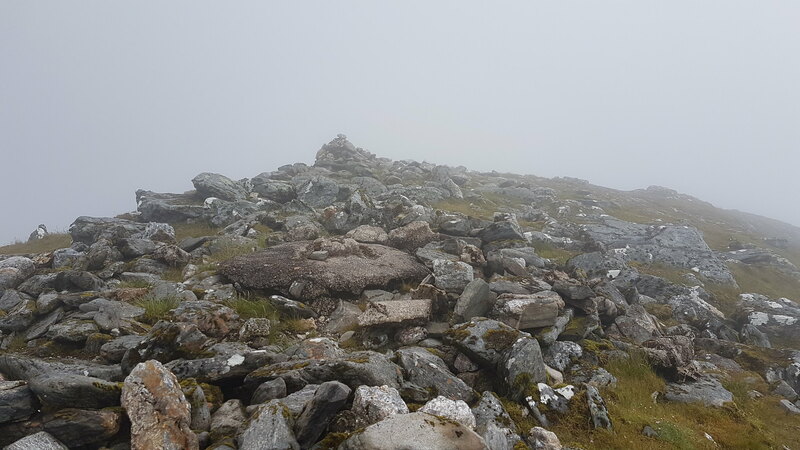 We headed back up the way we came looking on both sides for a magical path but didn’t find anything and decided to regroup back at the cairn, where we were struggled to stand upright. 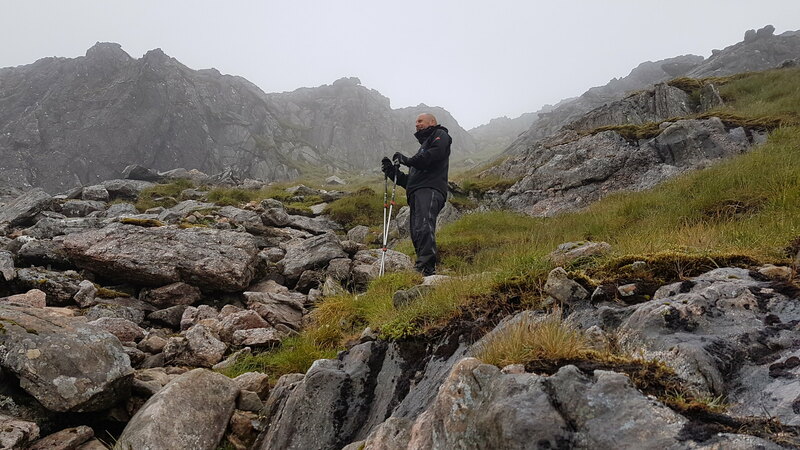 As we grappled with our flapping maps and tried to take GPS readings, we came to the slow realisation that we were on the wrong hill still - Garbh Chioch Mhor and nowhere near Ciche! 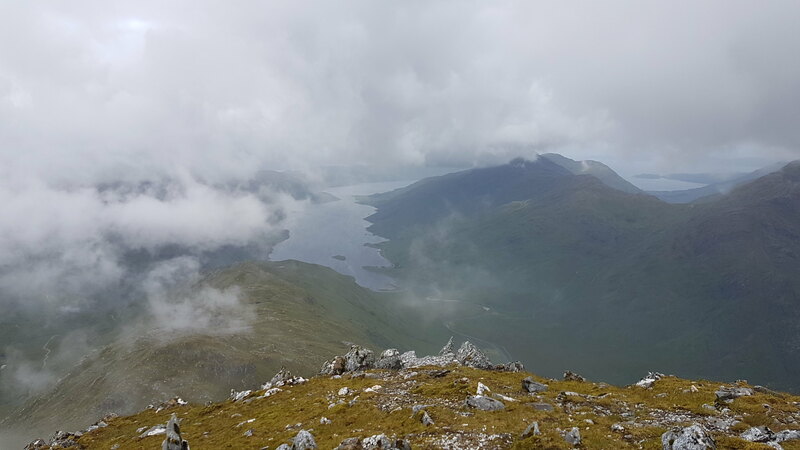 As we ascended the clag thankfully started to shift in small intervals and once we topped out on the summit, we temporarily got the amazing views down Loch Nevis, out to Knoydart/Loch Hourn, Ben Aden and back to Sgurr Mor but sadly not the ridge. What was memorable and amazing to see was the speed of the clag moving in, up and over us. It was blowing a hoolie and I probably resembled a mix of MC Hammer and a Michelin man. 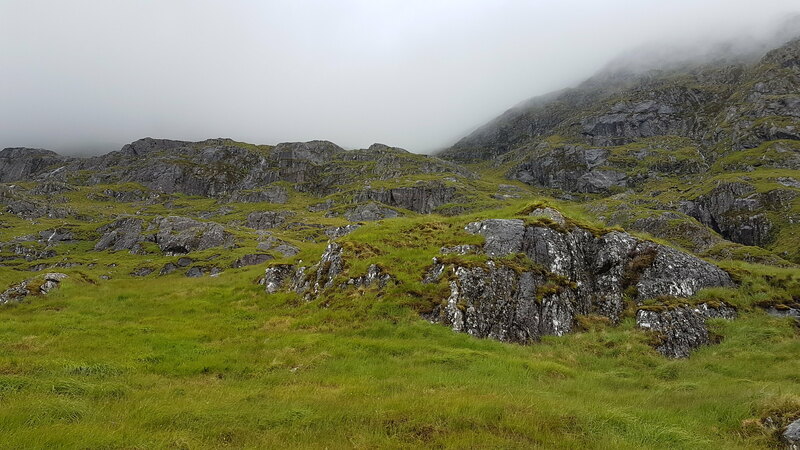 Once we had our fill, we went back down to the bealach for a well-deserved sarnie and pork pie. As this was Mark’s last hill, we bid farewell. The wind-assisted climb back up Garbh Chioch Mhor was swift and the navigation onwards to Garbh Chioch Bheag was straight-forward thanks to the wall. The folk that built it must have been hardy souls. 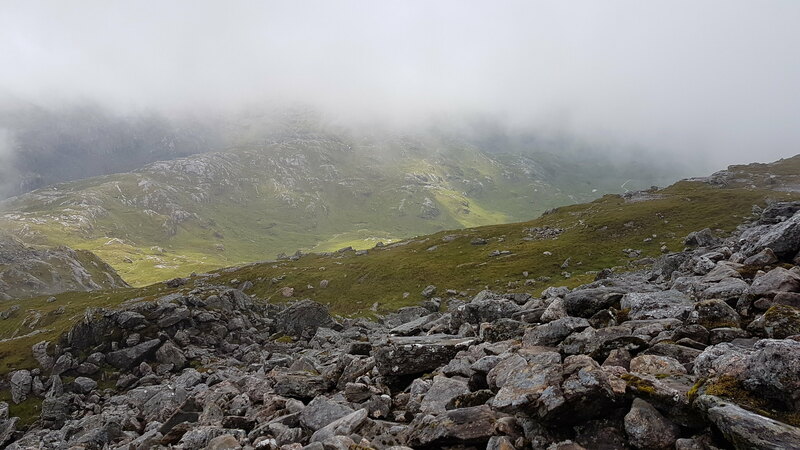 The descent off GCB down to the Bealach Coire nan Gall brought me temporarily out of the clag at around 1430. I couldn’t believe it had taken me 7 hours to this point. Down below I could see Mark making his way down the boggy track in the glen as I was feeling slightly tonked; I was somewhat envious. 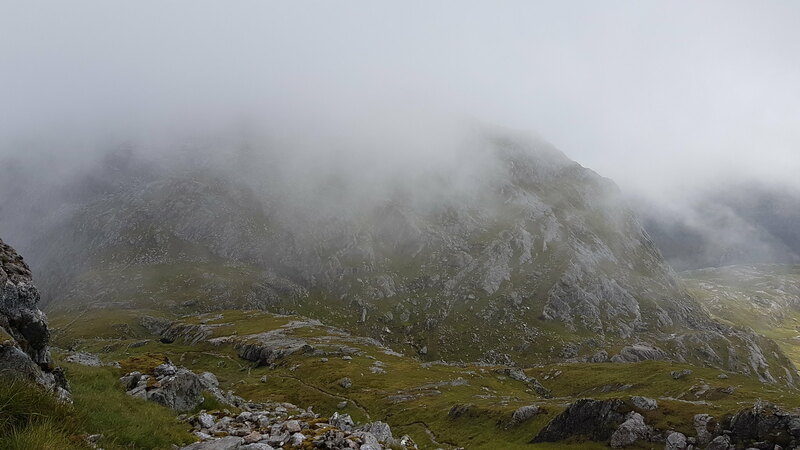 I sort of lost the path going up to the final peak, Sgurr nan Coireachan, which always makes it hard-going, but thankfully found it half way up. The combination of the clag and the strong winds on top dictated a quick photie and exit. Using my compass, I started walking in a southerly direction on an intermittent path but soon lost it as I hit an undulating boulder field. Visibility was awful. I could see from the map that there were several burns running off SnC and decided logically to descend and follow one of those. The descent was steep, boggy and slow-going. I ended up following the narrowing gorge of Allt coire nan Uth back down to the boggy path that I had walked up. It took me approx. 3.5 hours to get from SnC back to the car. It was a welcome sight and I was glad to get dry clothing on for the journey home. 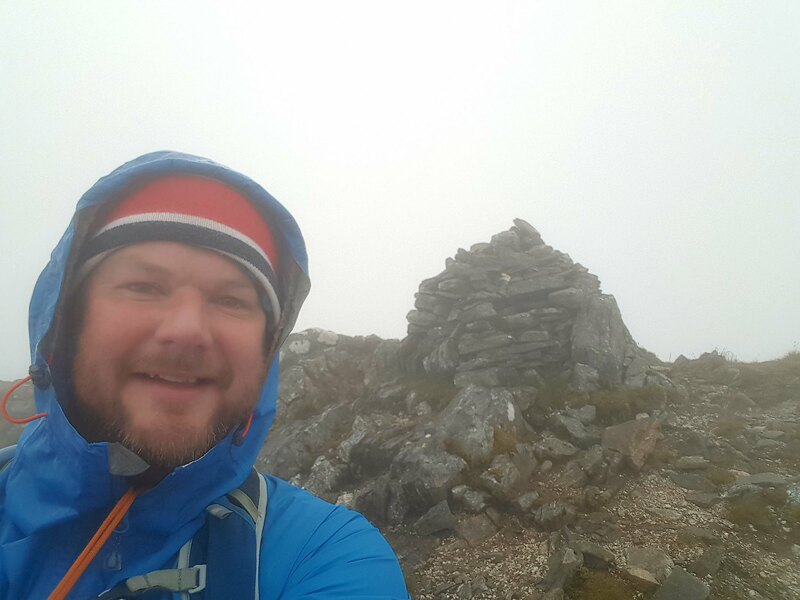 I was fully aware that this wasn’t going to be an easy day out but it was a lot harder than expected given the conditions and my route-finding. The Met Office forecast was way-off but nevertheless it was still an enjoyable day with a sense of achievement. I most definitely want to return to these hills but almost definitely via different routes!